Easy to cook, hard to resist. Halal Parve.Mix for balti style meat & tomato curry. Peshwari style Meat with Tomatoes Ingredients Required - Quantity & Preparation: Beef/Chicken/Mutton - 1 1/2 kg small cubes Tomatoes medium - 6, ripe & unripe cubed/500g Green Chillies - 6 medium, whole Garlic crushed - 1 1/2 tablespoons / 25g Ginger finely chopped - 5 tablespoons / 3"pieces / 40g Ghee/Oil/Butter - 2 cups / 350g Shan Karahi/Fry Gosht Curry Mix - One packet (use less for mild hot) STEPS OF COOKING 1. Place the meat in a small pot and add 2-3 cups of water, garlic, ginger and Shan Karahi Gosht Curry Mix. Cover and boil on low heat until the meat is tender. (When the meat is tender about a cup of liquid stock should remain in the pot). 2. In another pot heat ghee/oil and add tomatoes. Fry until half the juice of tomatoes has dried up (about 15 minutes.) 3. Add the cooked meat, stock and green chillies to the fried tomatoes. Cover and cook on high heat for 5 minutes, then for 10 minutes on low heat. SERVING SUGGESTION Garnish with lime juice and chopped green coriander. 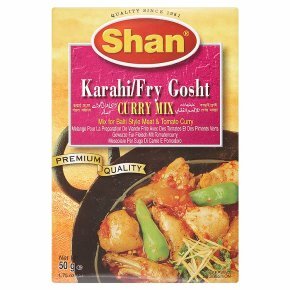 Serve delicious Shan Karahi Gosht with hot naans. Serve 6-8 persons. Balti Gosht In the above ingredients; add 4, medium quartered onions and 6 tablespoons lemon juice. Follow Step No. 1 of Karahi Gosht. Then heat ghee/butter add cooked meat, garlic and ginger. Fry for 5 minutes on high heat. Stir continuously. Add quartered tomatoes, quartered onions and whole green chillies. Cover and cook for 10 minutes, add lemon juice before serving.